The Marysville, Wash., Police Department has deployed GoldKey flash tokens in order to meet FBI Criminal Justice Information System (CJIS) requirements for authentication and encryption of sensitive data. Law enforcement officers who wish to access FBI data must now also have the ability to encrypt it with a minimum 128-bit encryption key during access or if the data is carried outside of secure facilities. The Marysville Police Department opted to use GoldKey’s flash tokens to meet the requirements, as the tokens contain a secure method of advanced authentication and can automatically store encrypted CJIS files. 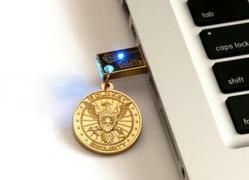 Each officer in the department now has a GoldKey to unlock laptop computers, access the CJIS System and store encrypted files. Upon leaving a patrol car, the officer is able to securely transport files on the token. GoldKey is also compatible with law enforcement Active Directory Systems. Marysville Police Department switched to the GoldKey system six months ago, and officers now must use it to log in to the system. The FBI requires all law enforcement organizations to implement such levels of security technology by October 2013.